Tourist Tanzania volunteering programs is one of its kind program in Tanzania, giving the opportunity to tourist to not only enjoy the tourist attraction Tanzania could offer but at the same do something rewarding. 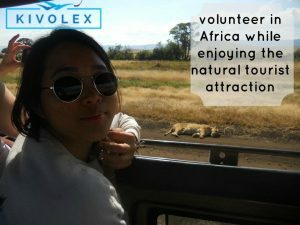 Our Tourist Tanzania volunteering programs allow volunteers to get involved in Kivolex four volunteer projects. Tourist are allowed to get involved for as little as two days, due to tight tourists schedule they usually have. It has been a very common trend for tourist t they involved in volunteering in the recent days. Due to the nature of the two activities, somehow its better to do them both. Our Tourist Tanzania volunteering programs caters for both volunteers and tourists. We encourage our volunteer to get engaged in tourism as well through our Tourist Tanzania volunteering programs. Volunteering abroad could be an opportunity of a life time, hence we have to make the most of it. Most volunteers are considering to volunteer only once in a life time. It is through this factor that we are encouraging them to use this opportunity for tourism also. Setting aside three days in volunteers scheduled for Safari after volunteering is something that we recommend. We are creating Tourist Tanzania volunteering programs that suites the needs of volunteers and Tourist. This programs takes into consideration that schedule of these travelers is very tight. Tanzania is a beautiful country with a whole lot of tourist Attractions. Its sis a country whose number of tourist is increasing steady year after year. Its is an objective of Tourist Tanzania volunteering Programs to see the number of volunteers also increase with the increase in tourists. The change we face here is how to convert these tourists into a short term volunteers. Usually Most tourists would have a day or two after their Safari to explore Tanzania. It is the Goal of Tourists Tanzania volunteering programs to see that tourists use these days for volunteering purpose.